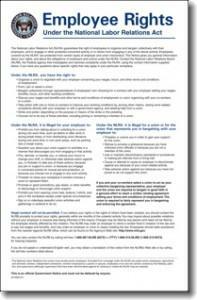 NLRB Publishes New Poster … What’s the Impact? Make room for another poster on your breakroom wall. This week, the National Labor Relations Board (NLRB) released the highly controversial notice that employers will have to post in their workplaces by Nov. 14, 2011. The poster notifies employees of their right to form or join a union, and it gives examples of unlawful employer conduct under the National Labor Relations Act (NLRA). Download the poster from a link on our HR Specialist website, www.theHRSpecialist.com/unionposter. Business groups loudly oppose the new poster. The National Association of Manufacturers went as far as filing a lawsuit last week to block the poster regulation, saying the new mandate is "just another example of the board's aggressive overreach to insert itself into the day-to-day decisions of businesses—exerting powers it doesn't have." And two bills introduced by Republicans in Congress last month aim to rescind the posting requirement, as well as prohibit the NLRB from enforcing “any rule that requires employers to post notices relating to” the NLRA. The lawsuit and legislation are two reasons the NLRB rushed to release the poster this wee k so far in advance of the Nov. 14 posting deadline. The board originally had said it would release the poster by Nov. 1. So what do you think? And how will the poster affect your workplace—if at all? I agree – my employees don’t read these or really even look at them. I do not think it will prompt much in the way of responses. 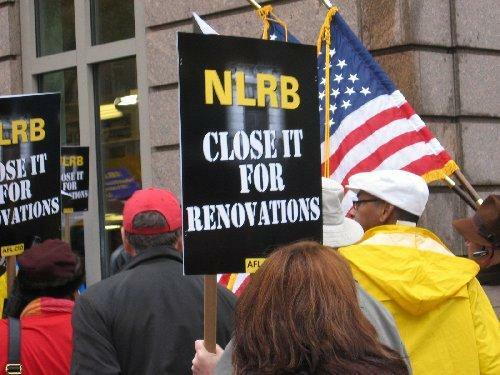 But it is a little over the top by the NLRB to insist we post this thing that is so slanted toward Unions it is a joke. Hopefully the lawsuit will make this a mute issue by the time Nov 14th rolls around! I agree with Alex. I am waiting until the deadline to post. Most employees never read the postings and I could run a survey today and the only one that most would even acknowledge is the minimum wage posting. The poster will probably prompt a few questions from our employees at the beginning, but it will eventually become just another thing on the wall that they ignore. Still, I’m waiting until Nov. 13th at midnight to post this thing — I just don’t like the way the NLRB seems to be cramming so much down our throats lately.